A group well-known and -loved by local audiences, The King’s Singers, will be at Bethel College as part of a tour celebrating 50 years of performing. The concert is Feb. 12 at 7:30 p.m. in Memorial Hall on the Bethel campus, part of the 2018-19 Hesston-Bethel Performing Arts series. The King’s Singers will be presenting their “Gold50” program as part of the tour and three-disc recording that mark 50 years of the group’s existence. The King’s Singers was born May 1, 1968, formed by six recent graduates of King’s College, Cambridge. By chance, the original vocal lineup was two countertenors, a tenor, two baritones and a bass, and the formation has never changed since. 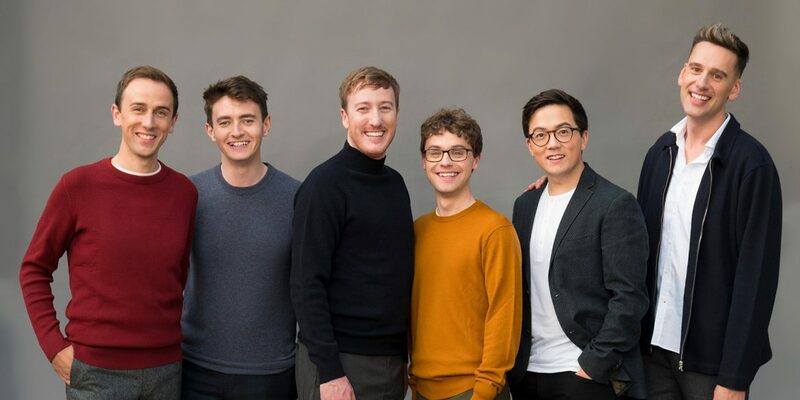 The current members of The King’s Singers are countertenors Edward Button and Patrick Dunachie, tenor Julian Gregory, baritones Nick Ashby and Christopher Bruerton, and bass Jonathan Howard. The group has appeared on the world’s great stages, from London’s Royal Albert Hall to the Sydney Opera House to Carnegie Hall and been ambassadors for musical excellence across the globe. Among many accolades are two Grammy® Awards (2008 for Best Classical Crossover Album, Simple Gifts; 2011 for Best Choral Performance on Eric Whitacre’s Light & Gold), an Emmy® Award, and a place in Gramophone magazine’s inaugural Hall of Fame. Their consistent love of musical diversity has fueled The King’s Singers’ commitment to creating new music. Over 50 years, they have commissioned more than 200 works, by composers who include Luciano Berio, Gabriela Lena Frank, György Ligeti, Nico Muhly, John Rutter, Toru Takemitsu, Sir John Tavener and Eric Whitacre, as well as countless arrangements of everything from jazz standards to pop charts. The King’s Singers’ “Gold50” program reflects the group’s half-century of musical diversity, whether ancient motets, brand new commissions or much-loved arrangements of close-harmony music from the last 50 years. In addition to releasing the compilation album in honor of 50 years, The King’s Singers also has established a U.S.-based charity, The King’s Singers Global Foundation. The group hopes to extend its impact by way of education and commissioning new works even further. In the spirit of The King’s Singers’ commitment to teaching and coaching young singers, they will hold a masterclass with the Bethel College Concert Choir and Hesston College Bel Canto Singers ahead of their Feb. 12 evening performance, at noon in Memorial Hall. Two events remain in the HBPA season. On March 5, the Berlin-based Armida Quartet performs “Mozart Exploded” at Hesston Mennonite Church, juxtaposing Mozart with contemporary composers as well as letters written by Mozart. Wrapping up is singer/songwriter Ruth Moody and her band, April 9 in Memorial Hall. Many audiences know Moody as part of the all-female folk group The Wailin’ Jennys. Single tickets can be purchased at either Hesston or Bethel College weekdays during regular business hours. Bethel and Hesston students receive free admission. See hesstonbethel.org for more information. The series started in 1982 as Hesston Performing Arts, then expanded in 1998 when Hesston College joined forces with Bethel College for Hesston-Bethel Performing Arts, to present five performances by world-renowned or regionally acclaimed artists each school year. HBPA is funded in part by the City of North Newton, Excel Industries and Hustler Turf Equipment (Hesston), the North Newton Community Foundation, the Kansas Creative Arts Industries Commission, which receives support from the National Endowment for the Arts, and media sponsor KMUW-FM 89.1, with additional funding from area businesses and patrons.